A Lancashire golfer will be fulfilling the ambition of a lifetime when he embarks on a double mission next month. Glenn Turner is taking a year out in a bid to earn him a place in the record books - and raise more than £1m for children's charities. The London-born golf professional plans to play about 500 golf courses on a 12-month trip which will take him on a mad dash across the UK, as well as to Ireland and Spain. Along the way, the 46-year-old will enjoy the company of a host of celebrities - including comedian Bobby Davro, a close friend, and Liverpool footballing legend Kenny Dalglish. It was while browsing the internet that Glenn got the idea for his record-breaking attempt. "I was looking at all the golfing achievements on the Guinness World Records website and I found one which is the most holes played in a 12-month period," said Glenn who lives in Preston. "It is held by an American guy and he did all those on one course. "I have always wanted to get into a camper van and play all the best courses in the UK, so I asked Guinness if there was a world record for the most 18-hole golf courses in a 12-month period. "It will actually be a new world record - there is not an existing one for what I am going to do. "I have put on the application that I want to play a minimum of 365 courses in a 12-month period, which is at least one a day. During British summer-time, if the courses are available I will be able to play two on some days. "If I can do 500 courses that's a good target to set and it's going to be hard for someone to beat because organising this is an absolute nightmare - you can imagine the logistics." 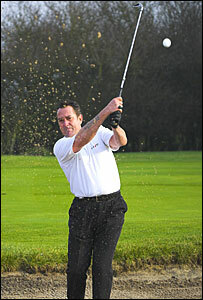 Glenn, who is based at Charnock Richard Golf Club, will play a four-ball on every course, which must all be at least 6,000 yards in length. The Blackburn Rovers football fan will tee up with a local club representative and, on some occasions, a celebrity, with the remaining place or places being auctioned on eBay, which is one way in which he will raise money for good causes. The name of every player and every club involved in his bid will be written into the record books. All money raised - Glenn hopes it will top £1m - will go to local children's hospices around the UK and the Rhys Daniels Trust's home from home appeal, which supports families of youngsters with life-threatening illnesses. "I want to raise awareness locally as well as money," said Glenn who will raffle off his motor home and golf buggy at the end of the 12 months, with all the proceeds again going to charity. 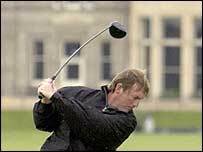 Golf has been his life's sporting passion - he has played it since he was eight and first played off scratch at 19. As part of his record attempt, he will keep a logbook, while his tour manager will produce a video diary of the year. Former snooker world champion Dennis Taylor, TV pundit and ex-footballer Andy Gray are other celebrities who have agreed to partner Glenn at some stage. The tour begins on 2 April at Dumbarton in Scotland and is scheduled to end on 1 April next year, probably on a course in the south of England. And he summed up his approach to his golfing adventure by saying: "I'm just a normal guy going out there having a bit of fun and raising money for charity."